This a character, three bedroom, two bathroom, two level completely renovated, penthouse apartment with a large roof top deck. Lots of mid century era features including railings, refinished hardwood floors, massive rooms, a curved feature9 feet high ceiling on main floor with updated kitchen and cabinets. Spacious 7 1/2 feet high basement with rec room, laundry and 3 pieces bath and other 1/2 basement for storage. Double garage with open parking. Good investment property or hold to build new! I have sold a property at 708 2228 BROADWAY W in Vancouver. Vancouver, BC - August 2, 2013 - Sunny weather did not slow the pace of home sale activity in July. Last month was the highest selling month of the year in Greater Vancouver and the highest selling July since 2009. The Real Estate Board of Greater Vancouver (REBGV) reports that residential property sales in Greater Vancouver reached 2,946 on the Multiple Listing Service® (MLS®) in July 2013. This represents a 40.4 percent increase compared to the 2,098 sales recorded in July 2012, and an 11.5 percent increase compared to the 2,642 sales in June 2013. Last month’s sales were 0.1 percent above the 10-year sales average for the month. New listings for detached, attached and apartment properties in Greater Vancouver totalled 4,854 in July. This represents a 1.1 percent increase compared to the 4,802 new listings reported in July 2012 and a 0.4 percent decline from the 4,874 new listings in June of this year. The total number of properties currently listed for sale on the MLS® in Greater Vancouver is 16,618, which is an 8.1 percent decrease compared to July 2012 and a 3.9 percent decline from June 2013. The sales-to-active-listings ratio rose two and-a-half percentage points between June and July to 17.7 percent in Greater Vancouver. This is the highest this ratio has been in Greater Vancouver since April 2012. The MLS® Home Price Index composite benchmark price for all residential properties in Greater Vancouver is currently $601,900. This represents a decline of 2.3 percent compared to this time last year and an increase of 2.3 percent over the last six months. Sales of detached properties reached 1,249 in July 2013, an increase of 59 percent from the 787 detached sales recorded in July 2012, and a 13.7 percent increase from the 1,099 units sold in July 2011. The benchmark price for detached properties decreased 3.1 percent from July 2012 to $920,500. Sales of apartment properties reached 1,210 in July 2013, an increase of 31 percent compared to the 927 sales in July 2012, and an increase of 16.3 percent compared to the 1,040 sales in July 2011. The benchmark price of an apartment property decreased 1.6 percent from July 2012 to $368,300. Attached property sales in July 2013 totalled 487, an increase of 27 percent compared to the 384 sales in July 2012, and a 12.7 percent increase from the 432 attached properties sold in July 2011. 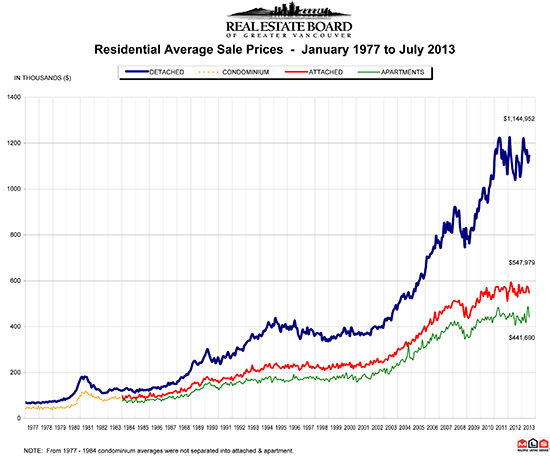 The benchmark price of an attached unit decreased 2.6 percent between July 2012 and 2013 to $456,700.